First, if you haven’t already, check out The Mega Man Network’s cool commercial collection and retrospective. 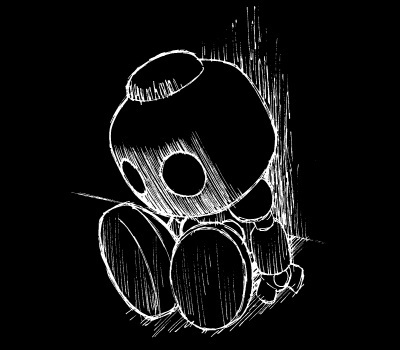 And be sure to check out Protodude’s early EXE press collection as well, there’s some great stuff there that you rarely find nowadays! Presenting a rare treasure, the Capcom Design Room’s concept art! A collection of the original artwork that was the foundation for the characters who appear in the game, and even actual unused concept sketches too! The character of Netto came about from these rough concept sketches. The look of his clothes were decided quite early on as you can see, but these Nettos have a younger, less mature look to them. 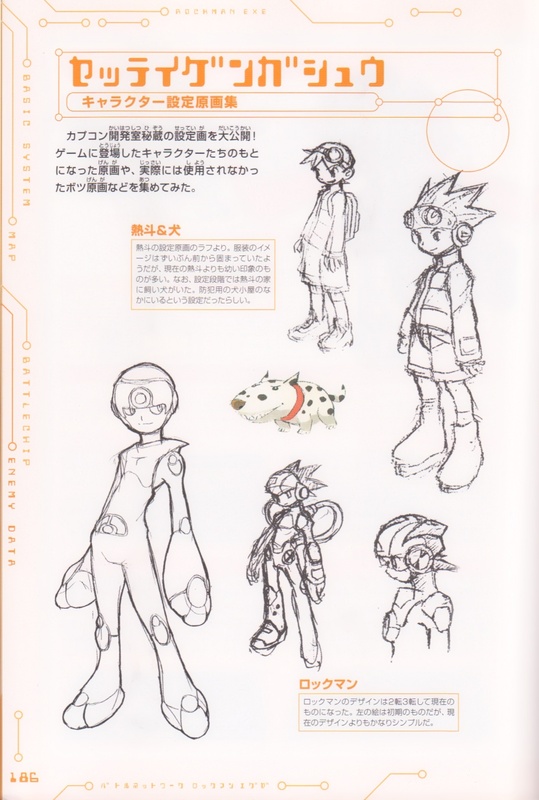 Also, in the early concept phases, Netto’s family had a pet dog. It looks like he would have lived in that crime prevention dog house from their yard! 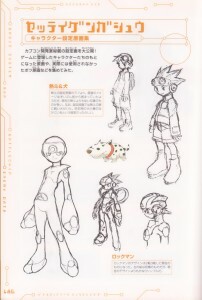 The second and third Rockman sketches shown here would have elements incorporated into the final Rockman design. 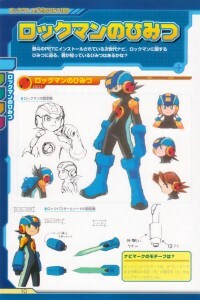 The picture on the left is from a very early phase, with a very simple design compared to the modern Rockman. The protagonist’s rival, Ijuuin Enzan. You can see that his image was always as cool! An unused concept of Mayl. Notice her facial expression in the picture on the left! Did she have a cheekier, more audacious personality in the early drafts? Saloma, the nature enthusiast girl. 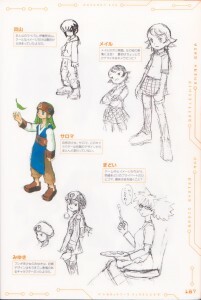 She’s hardly changed at all from her early concepts. Here’s a private scene of Madoi Iroaya, showing a different side of her than what you see in the game. Could painting be one of her hobbies? Miyuki, the strange girl. We can see that her early designs portrayed her with a little more expressive facial personality. I’m glad they ditched the goggles for a headband. 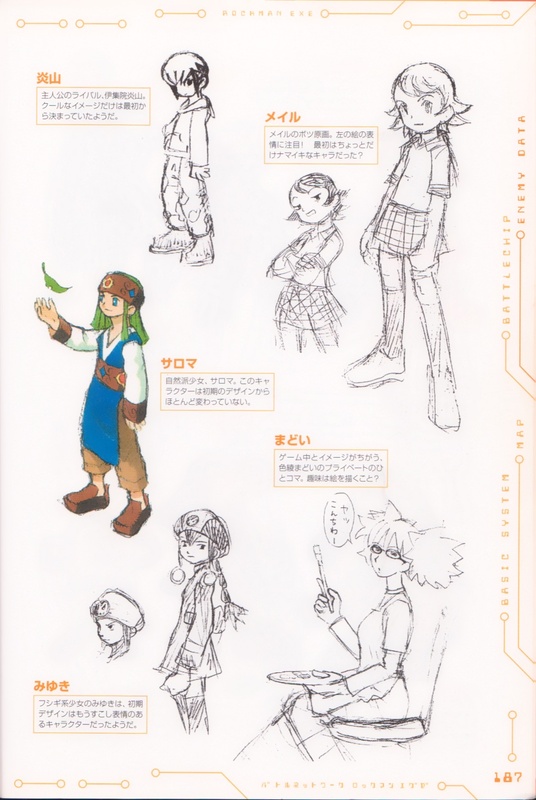 There were some other Netto concept designs with different hats that weren’t published in this book, too. And of course as Protodude noted, the family dog would become the basis for EXE5‘s Gow, the dog of Netto’s grandfather Tadashi Hikari who became the guardian of the Hikari Report. Moving on! 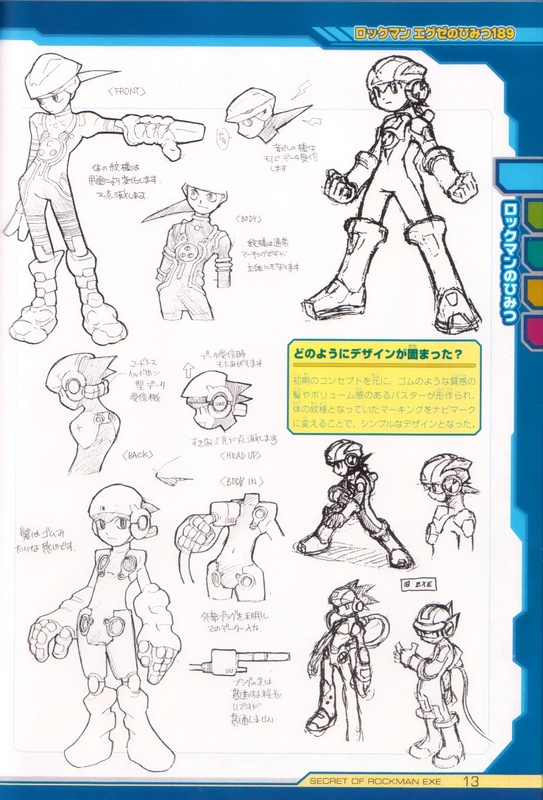 Blues at this concept stage appears to have been more of a palette swap of Rockman’s design. 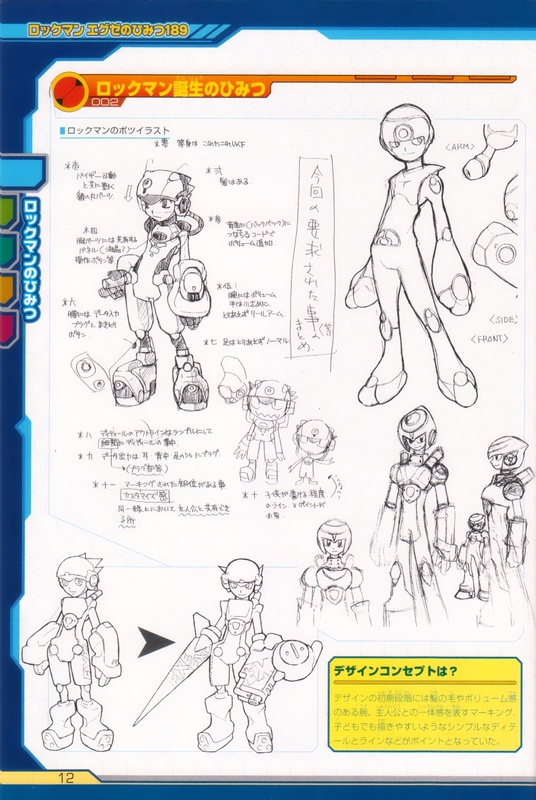 Skullman and Roll’s early concepts. Skullman had a much more mechanical appearance than his final design does. In previous games, Rush was Rockman’s trusty support mecha. Unfortunately, it seems that this time he only has a bit part. 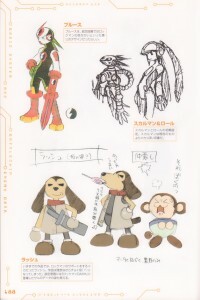 Data the monkey from Rockman DASH can be seen next to Rush in this concept art. In his downtime, he opens up the front of his coat to relax a little. He and Data have the same dark eyes. Here are some roughs of unused characters that didn’t appear in the game. Perhaps if they announce a sequel, some of these characters will be seen challenging Netto as enemy net battlers? I don’t mind the colors, but Blues without a visor just doesn’t feel right. Poor Data, did that mean old Rush steal your lollipop? Don’t look now, but he also stole your development team! With that attitude, no wonder Rush (aka “Mole”) appeared primarily as an enemy in the EXE games (though later you could call him to your aid in one-on-one vs. net battles). The EXE anime would reprise Rush’s role to be more of a helper character. That’s it from that book, and normally I’d call 4 pages a day. But you only turn ten once, so why don’t we live a little. Let’s do four more! 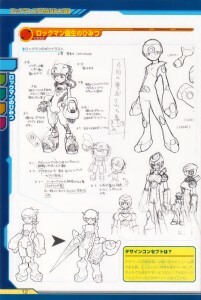 This time from the Secret of Rockman EXE Official Creation Illustration Guide, pages 10-13. 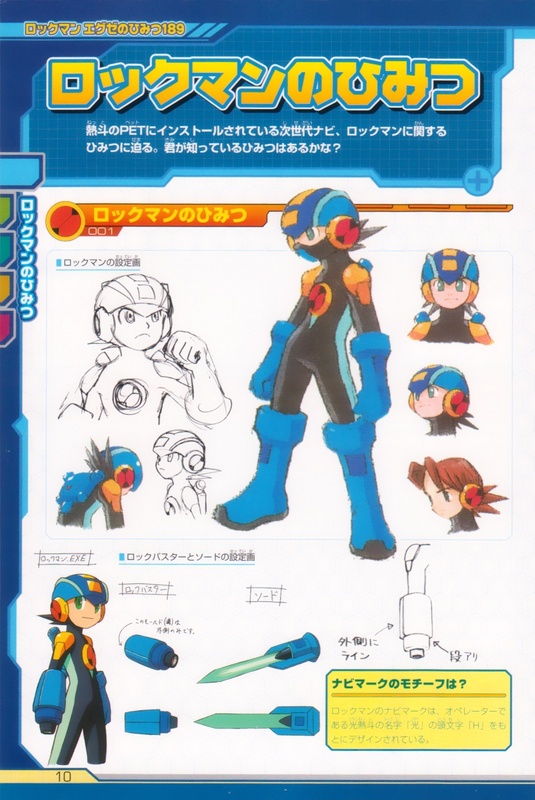 Here are gathered the secrets related to Rockman, the next generation navi that was installed in Netto’s PET. Perhaps you’ve discovered some of these secrets for yourself already? What was the motif behind the Navi Mark? Full Syncho is the condition where the souls of both Navi and Operator become as one, increasing the Navi’s abilities far beyond their normal limit. 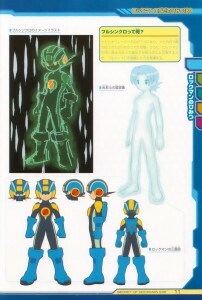 What’s more, when the genetic code of Saito Hikari that lies dormant within Rockman resonates with the heart of Netto, they can transcend this state and tap into into a power far greater than Full Synchro! 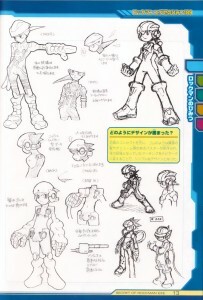 These pages showed off some of the first finished Rockman designs as well as the polished art that would be his reference for the rest of the series. There’s also some revealing of Rockman’s secret nature as Netto’s late twin brother Saito (in Mega Man Battle Network, Lan’s brother Hub). From the initial stages of the design, the key focal points became things like the hair, the volume dial on the arm, the connection with the protagonist through the markings, and using simple lines and details so that even small children would be able to draw him without too much difficulty. How was the final design arrived at? Flowing from the initial concepts, things like the rubbery pointy hair and the buster based on a volume knob were incorporated, while those stripe patterns on the body and the Navi Mark were changed a little to create the final smart, simple design. With the theme of living inside a computer network, I guess it’s no surprise that one of the early designs resembles the style of the movie Tron a great deal. Some recurring ideas in the early designs which became subdued in the end include all the plugs, cables, and antennas used for data transmission. They were finally scaled down to just corresponding with the backpack unit, leaving the rest of Rockman’s body fairly uncluttered. Given the explosive popularity of EXE over the years, a lot (or maybe all?) of these images have already hit the net in some way. 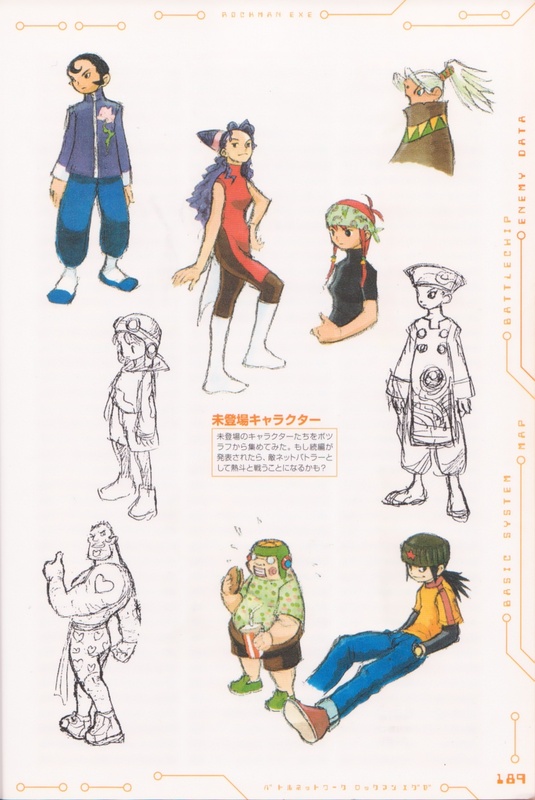 You can probably expect to see them again in the recently released Mega Man Battle Network Official Complete Works book brought over by Udon. (Not that I know for certain, since I’m still waiting on Amazon to ship me my copy.) I don’t even have to tell you how much Battle Network fans have been looking forward to it. Pretty excellent timing! Happy 10th Birthday, Rockman.EXE! Here’s looking at you, kid! 8 Comments to "EXE Turns Ten!" I happen to own both of these books, and I frigging love them. I don’t even know how many hours I spent studying the designs in the Secret of Rockman EXE […] book, up to the point of getting some drawing practice based on that art. I eventually used that to come up with my own fan character, Unity.EXE, which I designed to fit in-universe as much as possible. I’m not afraid to say that the Battle Network series influenced me quite a bit, far more than the other Mega Man series did. The games are fun, the gameplay is original, and it all fits together as a solid Mega Man spinoff. Beyond that, as someone always using the Internet and computers in a way or another, the concept of a digital friend always following you around, stored in a useful handheld electronic device really struck a cord. I actually purchased a somewhat similar-looking, pocket-sized computer 18 months ago and I carry it with me pretty much everywhere I go. I use it to watch TV shows, access the Internet or play games, even if it lacks the actual AI that can hold its own in a discussion! You know, I never questioned the hair thing. Since the hair is really just data in cyberspace, I guess there doesn’t even have to be a reason. I bet the navi or operator could technically change the hair color at will just with altering their customization settings. Hey Doc, what was your inspiration behind the navi mark on your character? I came up with the emblem while thinking about the overall theme of the character: Internet and global communications. Both simple and well thought-out. I expected no less from you! By the way, I just got my delivery from Amazon yesterday and once again Udon did a really great job. I think all of these images are in there, too. I have Secrets as well, and I was really disappointed by Official Works’ teeny-tiny sizes of the images taken from this book. And Secrets is a small book as it is! Sad but true. Seems like the more pieces they try to cram into a book, the smaller the art becomes. Luckily, that didn’t stop me from spending hours thumbing through it and enjoying every minute!